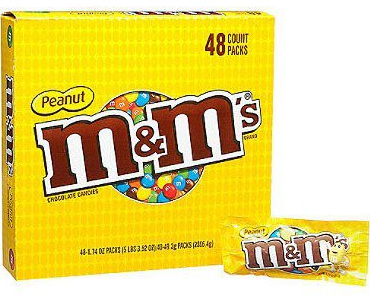 M&M's Peanut candies come wrapped in individual packs so you can throw them into lunch boxes, add them to pinatas or even give some away as party favors. Just prepare yourself for a ton of amazing chocolate and peanut flavor in every order! In the middle of a crunchy shell and chocolate coating, awaits a whole peanut for you to chow down on. Of course we're talking about the famous M&M's Peanut candies and are sure you've already experienced their addictive and delicious taste.